Last night was the night. 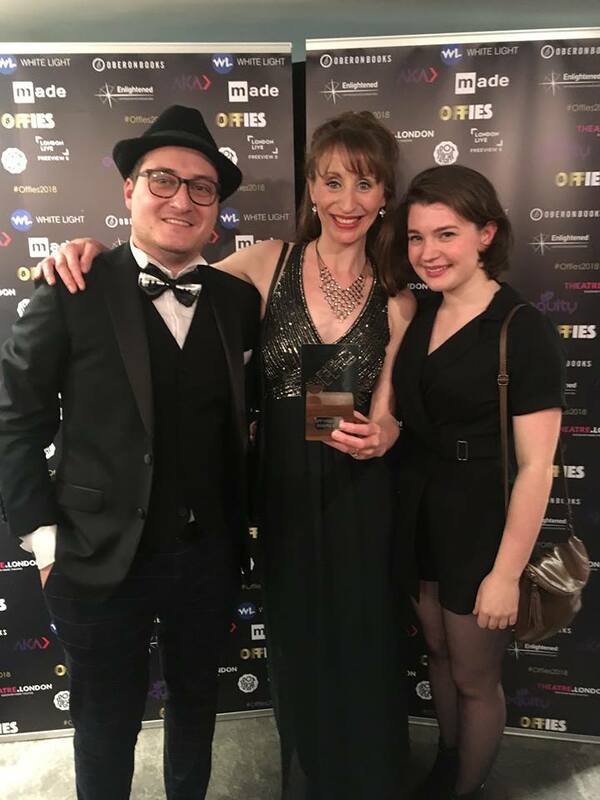 Panaretos Kyriazidis (MD), Helena Jackson (Associate Director) and I were at the Off West End Awards to see if the production of Tosca which I co-wrote and starred in would pick up the Off West End Award for Best Opera Production. We were up against some excellent and fierce competition - Hampstead Garden Opera's critically acclaimed production of L'Incoronazione di Poppea and Baseless Theatre's revolutionary site specific reworking of Cosi fan tutte. Whoever would come out on top, the vision and dedication it takes to create and perform in accessible and interesting new opera productions should not be underestimated. It takes an incredible amount of hard work and talent to reimagine well-known opera's successfully - but perhaps more than either of those, it takes bravery. Opera can be a bit of a 'sacred cow.' In the past 30 years, we've seen the magical halo that protected Shakespeare from adaptation melt away, and the bard has never been so relevant or so popular. You just have to look at Nicholas Hytner's Julius Caesar, currently playing to sell out audience's at The Bridge Theatre to see that; or to go back to the naughties and watch Baz Luhrmann's iconic Romeo and Juliet - the film that made Leonardo da Caprio's name. None of these mad impositions have undermined the Globe's beautiful traditional approach. There really is room for both! Yet still, slicing away at opera, paring it back so it can fit into smaller venues and modern costumes, and can be produced on less eye-watering budgets, is often frowned upon by industry aficionados. I often wonder if they think fringe opera is somehow trying to undermine or destroy them? All of this is not done to damage full-scale performances, but because in a fringe setting the risks are less, the audience are closer, the expectations are different and there is no 80 voice chorus to try and shift around a massive stage. So I want to take a moment and celebrate all the Off West End Opera productions that took place in 2017 and raise a toast to all those that will come - the good and the bad - they are proof that Opera is alive and kicking. In fact, I want to celebrate all Off West End and Fringe Theatre. Last night was a real feast of diversity and difference and a celebration of theatre that pushes at the boundaries and challenges the status quo. So, while thousands of miles away, Hollywood celebrated the Oscars, and the LA red carpet was walked by the stars of the present; last night in Deptford, a very short red carpet to The Albany Theatre may well have been trodden by a few of the stars of the future. And on to the all important question - who won? Well...as you may now know...WE DID. Huge congratulations to everyone involved with Tosca at the Kings Head Theatre. When Adam Spreadbury-Maher and I first conceived of this retelling of Tosca in a phone conversation in my bedroom, we couldn't have foreseen the incredible journey it would take us on. This show even put me in hospital (the shamefaced tenor accidentally broke my nose on day two of rehearsal and I had to have it realigned just 24 hours before the first preview), but it was all worth it. The list of names of those to be thanked is so long it probably doesn't bear repeating. 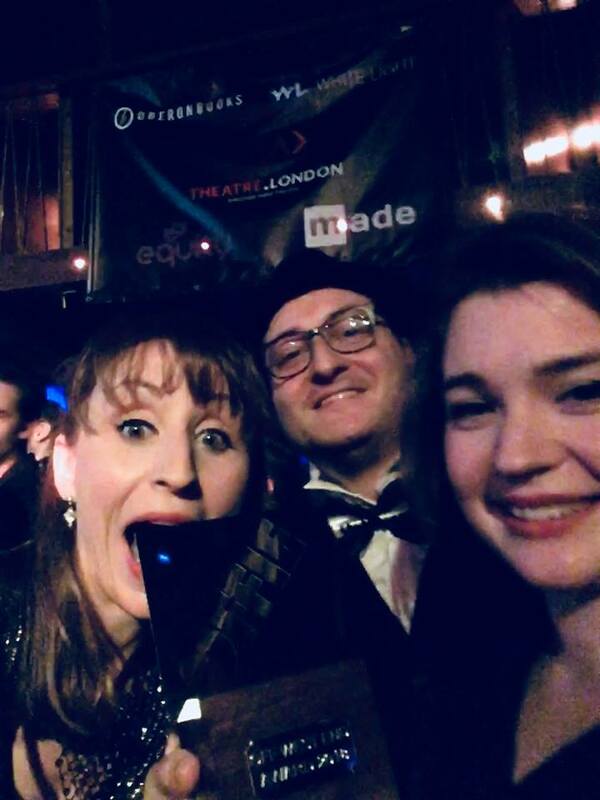 However, everyone who works at The King's Head is the thank for last night's award; the hugely talented casts; the exceptional musicians; the audiences who cheered us on and of course. Puccini himself. While the purists might have found the work challenging and cried out that it diminished the music which he wrote, I cannot help but think that Puccini himself would have celebrated last night with us.